How well do Lapwings and Redshanks grow? There has been an assumption that managers of nature reserves know how to provide the right foraging conditions for Lapwing and Redshank chicks. This paper in Wader Study shows that they do. For conservationists looking to increase wader populations, attracting birds to a chosen site is a good first step, but only if pairs can breed more successfully than they would have done elsewhere. To understand whether a species recovery prescription works or, if it does not, to understand what is going wrong, it’s necessary to measure nest success, chick growth and fledging rates. In their paper in the journal Wader Study, Lucy Mason and Jen Smart focus on the middle of these – how well chicks grow – to check whether the right feeding conditions are being provided. Breeding success for Lapwing and Redshank can be poor, even on protected sites, which often leads site managers and policymakers to ask whether low food availability might be limiting chick survival, despite management aimed at providing optimum foraging conditions. Although this question is difficult to answer on a large scale, Lucy and her team were able to monitor and compare wader chick body condition and rates of growth across a range of UK sites. If food availability is an issue, they expected to find that chicks would grow slower and weigh less than might be expected – or hoped. One of the main reasons RSPB scientists published this research was because site managers often ask for support to monitor invertebrates, in order to make sure that there is enough food for waders. There are lots of reasons why this is extremely difficult – i) what is enough? ii) chicks are catholic in their choice of prey, going for whatever is abundant and available at the time, so what do you measure and when? iii) linking food availability to growth and survival is inevitably tricky. The great thing about this paper is that it shows that, in general, well-managed sites will provide enough food. If managers are worried about food availability then monitoring the growth rates of chicks and comparing their data to the published information is far easier than measuring an invertebrate resource that varies hugely in space and time. To understand the growth rates of Lapwing and Redshank chicks, a total of 130 tags were deployed across 15 lowland wet grassland nature reserves and protected sites, within the UK, during 2009, 2010, 2012 and 2013. This enabled family parties to be tracked and helped to yield a total of 750 monitored individuals. All sites were managed with the aim of providing optimum conditions for breeding Lapwing and Redshank (both nesting and chick rearing). Chicks were ringed, tagged and measured when captured and subsequently about every eight days. Relocating the chicks involved tracking the tagged individuals and, through them, their ringed siblings. It was harder to recapture Redshanks, which are more cryptically coloured and move around more. Lucy and her colleagues demonstrated that, on average, Lapwing and Redshank chicks achieved growth rates similar to those calculated for larger samples of chicks studied in The Netherlands and the UK, and achieved better conditions more quickly than those measured in a standardised Dutch study. This suggests that food availability for wader chicks on well-managed lowland wet grassland sites is unlikely to be limiting chick survival and population recovery. To understand why populations of species such as Lapwing and Redshank are failing to recover, the focus should be on other potential causes of chick mortality, such as predation or agricultural activities. The positive message is that, if these other causes of chick mortality can be reduced, well-managed wader sites are likely to be successful in producing healthy fledglings and to facilitate population recovery. Grazing regimes need to be adjusted to create the correct sward height, heterogeneity of structure etc. See, for instance, McCracken, D. & J. Tallowin. 2004. Swards and structure: the interactions between farming practices and bird food resources in lowland grasslands. Ibis 146: 108–114. Increasing the height of the water table provides better feeding opportunities for adults and chicks. See, for instance: Eglington, S.M., M. Bolton, M.A. Smart, W.J. Sutherland, A.R. Watkinson & J.A. Gill. 2010. Managing water levels on wet grasslands to improve foraging conditions for breeding northern lapwing Vanellus vanellus. Journal of Applied Ecology 47: 451–458. Providing more wet habitat features, in the form of pools or foot-drains. See, for instance: Eglington, S.M., J.A. Gill, M. Bolton, M.A. Smart, W.J.Sutherland & A.R. Watkinson. 2007. Restoration of wet features for breeding waders on lowland wet grassland. Journal of Applied Ecology 45: 305–314 and Smart, J., Gill, J.A., Sutherland, W.J., Watkinson, A.R., 2006. Grassland-breeding waders: identifying key habitat requirements for management. Journal of Applied Ecology 43: 454-463. Using agri-environment schemes to achieve these habitat goals. See, for instance: Smart, J.A., Wotton, R., Dillon, I.A., Cooke, A.I., Diack, I., Drewitt, A.L., Grice, P.V. & Gregory, R.D. 2014. Synergies between site protection and agri-environment schemes for the conservation of waders on lowland wet grasslands Ibis 156: 576-590. Removing isolated trees, telegraph posts and wires that are used as look-out perches by corvids: Berg, A., Lindberg, T. & Kallebrink, K.G. 1992. Hatching success of Lapwings on farmland – Differences between habitats and colonies of different sizes. J. Anim. Ecol. 61: 469-476 and MacDonald, M.A. & Bolton, M. 2008. 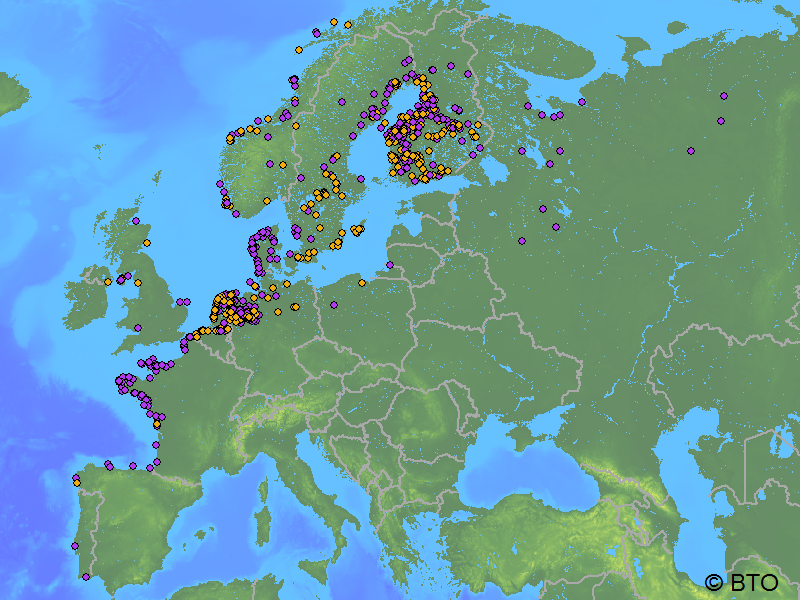 Predation on wader nests in Europe. Ibis 150: 54-73. Using electric fences to keep out foxes and badgers. Malpas, L. R., Kennerley, R. J., Hirons, G. J., Sheldon, R. D., Ausden, M., Gilbert, J. C. & Smart, J. 2013. The use of predator-exclusion fencing as a management tool improves the breeding success of waders on lowland wet grassland. Journal for Nature Conservation: 21, 37-47. Designing the lay-out of water features so as to reduce fox/nest interactions: Bellebaum, J. & C. Bock. 2009. Influence of ground predators and water levels on Lapwing Vanellus vanellus breeding success in two continental wetlands. Journal of Ornithology 150: 221–230. Diversionary feeding – providing areas of long grass which act as refuges for small mammals: see other WaderTales Blog. The majority of the chicks monitored in this study were predated before fledging. If this mortality can be reduced then sites which are managed with wader chicks in mind have the potential to support population recovery. Decisions upon how to reduce predation will need to be based upon the effectiveness and costs of the suite of solutions that are available, as well as ethical decisions as to which predators can be controlled and when – a potentially tricky issue for those managing nature reserves. Why is spring migration getting earlier? In recent years, earlier arrival of spring migrants has been widely reported in birds as diverse as swallows and waders but it’s not a universal trend; species such as British Cuckoos and Icelandic Whimbrels have not changed their arrival dates. Interestingly, many of the species that have not advanced timing tend to be those that are declining. By thinking about the mechanisms that enable some species to take advantage of earlier spring warming it might be possible to explain how timings and population changes may be linked. The simplest way for spring migration to advance would be for individual birds to change their arrival dates, arriving earlier now (either because they have departed earlier or migrated faster) than they did in previous years. These changes could be facilitated by changes to weather conditions before, during or after migration. In general, the arrival of short-distance migrant species has advanced more than long-distance species, which has led to suggestions that individual birds are able to assess conditions on their breeding grounds from afar, and to ‘fine-tune’ arrival accordingly. This could explain why long-distance migrants seem less well able to change their schedules than species which have less far to travel. This pattern of advances in arrival dates, and greater advances in short-distance migrants is seen in birds arriving into Iceland each spring (Gunnarsson & Tómasson). By monitoring the first dates of a range of migratory breeding species to the area around Laugarás, an inland village in southern Iceland, over the period 1988 to 2009, Tómas Gunnarson and Gunnar Tómasson showed that species which spend the winter further south than France showed no change in arrival, whilst those from further north in Europe were returning earlier. The southern group included the only wader in the Gunnarsson & Tómasson study which uses this migration strategy, Whimbrel (see diagram). One of the species that has advanced spring arrival (by about two weeks in the last two decades) is the Black-tailed godwit. 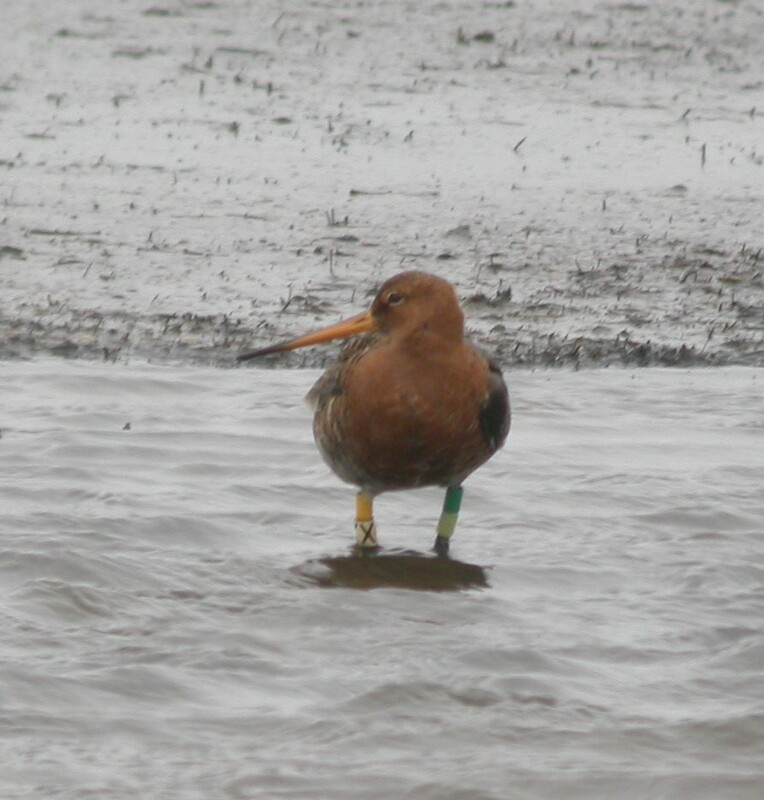 Since 2000, we have been recording arrival dates of individually colour-ringed godwits into coastal Iceland – giving us the opportunity to assess whether individuals have indeed brought forward their time of arrival. By making regular visits to the same sites we have discovered that the dates when we first come across individuals are remarkably consistent. Although the arrival of the whole population is spread over a five or six week period, the window in which a specific Black-tailed Godwit appears is generally predictable, whether he or she is a bird that we tend to first see in mid-April or mid-May. There are annual differences, of course, which appear to be linked to periods of adverse weather during the period of the sea-crossing (Gunnarsson et al 2006), from departure points in The Netherlands, The UK Ireland, France and Portugal, but there is no significant trend. Dates of spring arrival into Iceland of 54 individually marked black-tailed godwits recorded on arrival in between 4 and 8 years, from 1999 to 2012 (reproduced from Gill et al. 2014). 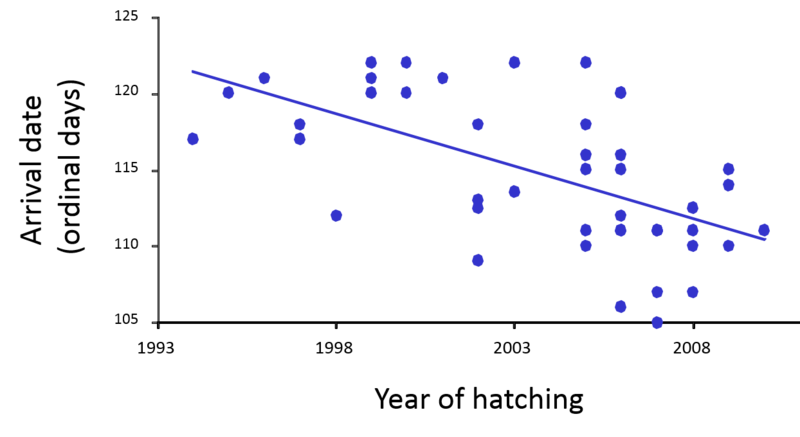 Whether an individual arrives early (left-hand birds) or late (right), the sighting dates for each bird are highly consistent. Although the arrival date for the population has been advancing at ~0.8 days per year (Gunnarsson & Tómasson 2011), there has been no trend in individual arrival dates (not significantly different to zero days per year); Gill et al. 2014. If individuals are consistent in arrival but the population is advancing, the advance must presumably result from new birds recruiting into the population being earlier-arrivers than recruits from previous years? Fortunately, there is a second long-running set of data that’s available to answer this question, in a large part because of the efforts of Pete Potts and Ruth Croger of Farlington Ringing Group. 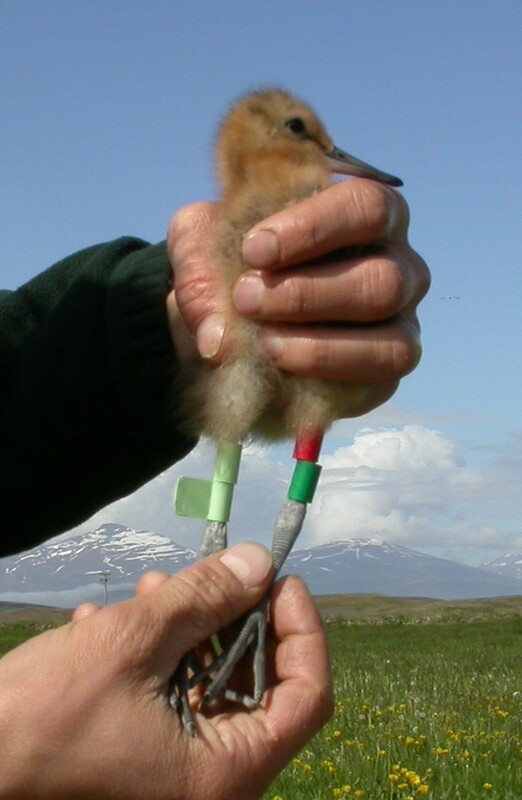 In the period 1999 to 2014, they organised teams of volunteers to ring Black-tailed Godwit chicks in Iceland, with the support of the Icelandic Natural History Museum. 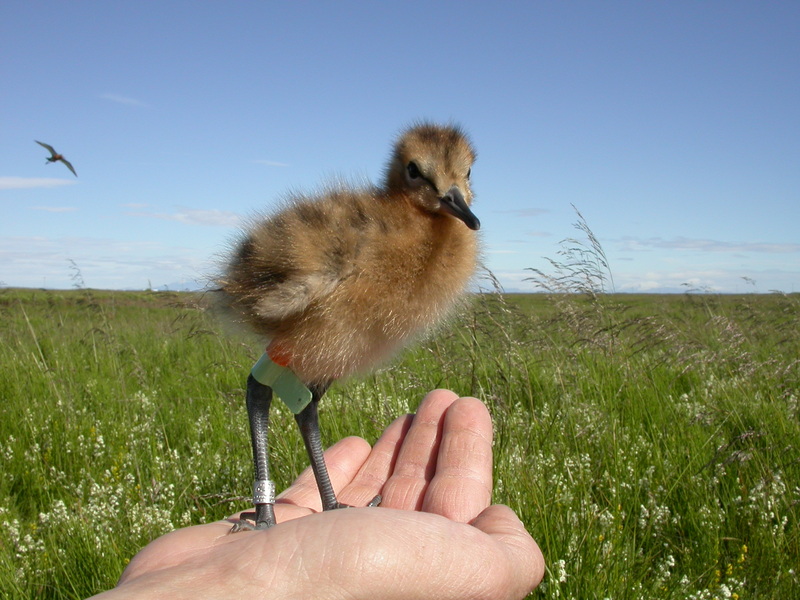 Significant contributions to the total of over 350 colour-ringed chicks were also made by Tómas Gunnarsson and José Alves, while researching the breeding ecology of Black-tailed Godwits for the Universities of East Anglia and Iceland. Wader chick mortality is quite high and there are further losses in the eighteen-month period between autumn departure from Iceland and the first return trip, eighteen months later, so it was wonderful to have a sufficiently big cohort of marked recruits to look at patterns and trends. For this study, arrival dates for 46 individuals of known hatch year were available for analysis. As can be seen from the graph, arrival dates of new recruits have been getting earlier, with birds hatched in the last decade arrive around two weeks earlier than individuals hatched in the 1990s. 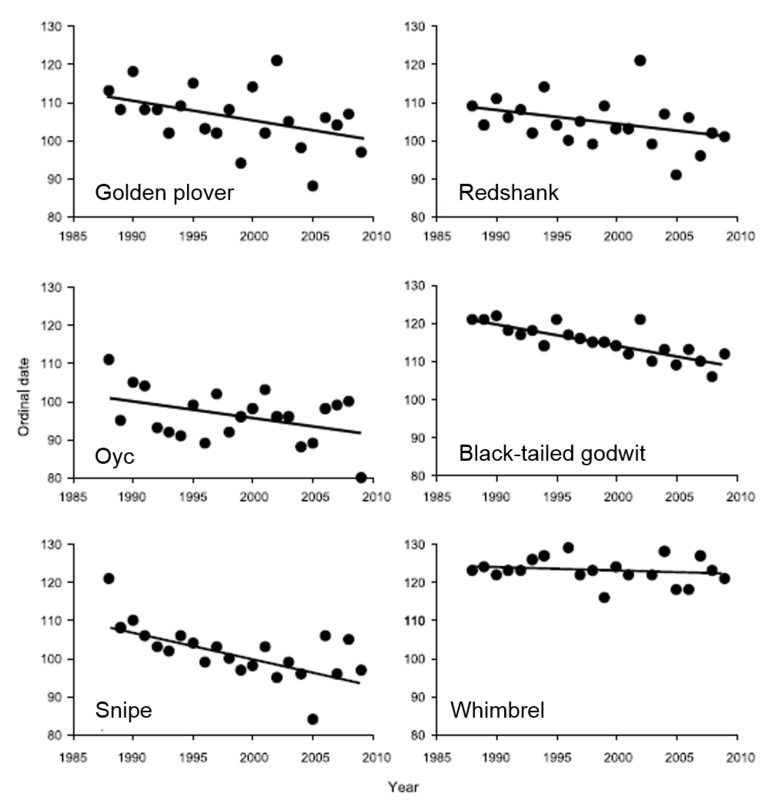 There are several reasons why recent recruits may be arriving earlier than in previous years, but the most likely is that this is a knock-on effect of advances in godwit laying dates that have occurred in recent decades. Icelandic godwits nest earlier in warmer springs, and the frequency of warmer springs has increased. Early fledging may benefit new recruits, by increasing the time available for them to migrate south, locate a good winter site and be in condition to return early when they recruit into the breeding population (Alves et al. 2013 http://www.esajournals.org/doi/abs/10.1890/12-0737.1 http://dx.doi.org/10.1890/12-0737.1). As their arrival date will be consistent thereafter, the overall timing of arrival of the population will advance. Many other studies of different species in which individuals are tracked during migration are showing similar levels of consistency in individual timing of migration. 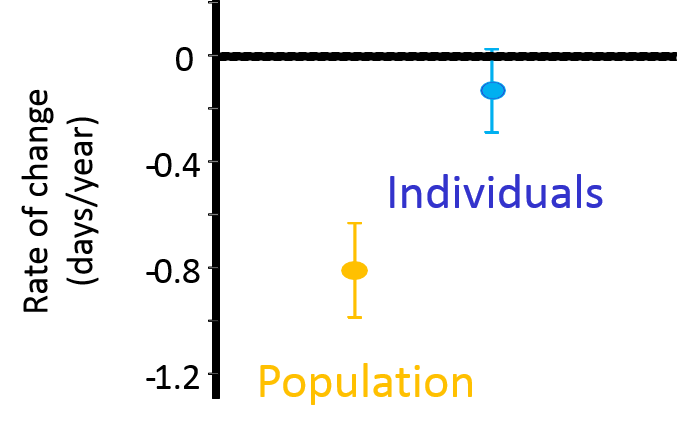 What then is causing the variation among species in rates of advance? Long-distance migrants typically arrive later on the breeding grounds and breed quite soon after arrival, while short-distance migrants can have quite large time gaps between arrival and laying, depending on conditions for breeding. Short-distance migrants therefore have more capacity to advance laying dates (because they are on the breeding grounds waiting for suitable conditions), while long-distance migrants, such as Whimbrels in Iceland, arrive later and so cannot breed earlier even in a warmer year. Advances in spring arrival dates may therefore result from advances in laying dates and associated benefits of early fledging for recruits, and lack of advance in long-distance migrants may be a consequence of arriving late and hence being unable to take advantage of early, warm spring conditions. In the Icelandic subspecies of Black-tailed Godwit, which is expanding in both number and distribution, it is clear that young recruits to the breeding population are driving the advance in timing of migration. We only know this because of the long-term programme of chick ringing by volunteers and because we have been able to record the timing of individual birds’ migratory activities over a large number of years. Funding for this work has been provided by the volunteers themselves, NERC , Icelandic Research Council and EU TMR. 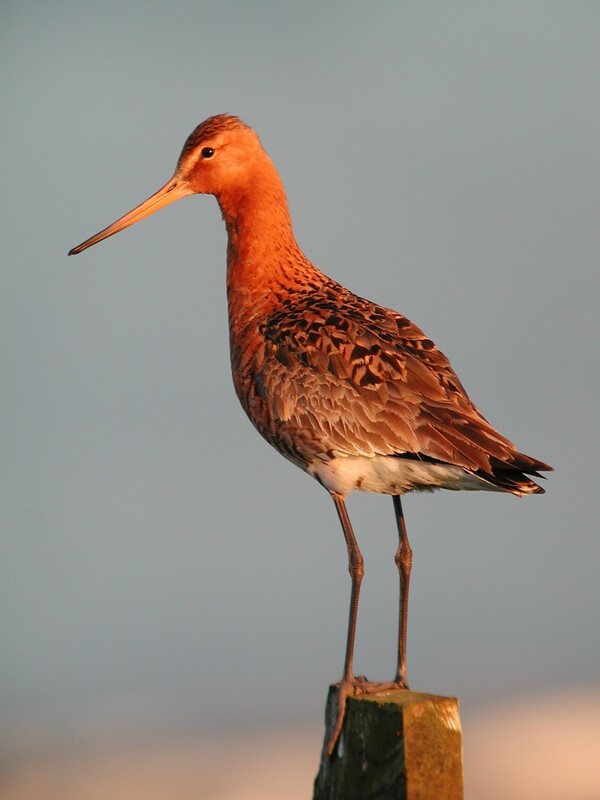 Please send reports of colour-ringed Black-tailed Godwits to Jenny Gill (j.gill@uea.ac.uk). She will reply with full details of any birds ringed on the Wash or forward your e-mail to colleagues running other schemes. Is the Curlew really ‘near-threatened’? If a Curlew can live for over 32 years and there are flocks of 1000 in Norfolk, how can they be described as near-threatened? Thirty years ago there were eight members of the world-wide curlew family but now we may well be down to six. The planet has lost one species, the Eskimo Curlew, with no verified sightings since the 1980s, and probably the Slender-billed Curlew as well. 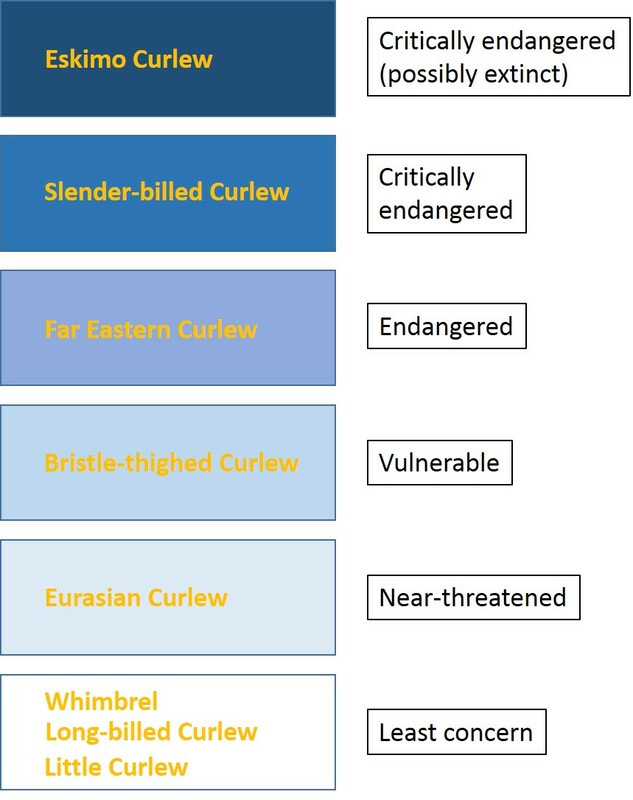 Of the others, Far Eastern Curlew and Bristle-thighed Curlew are deemed to be endangered and vulnerable, respectively, and our own Curlews are classed as near-threatened, which is the next level of concern. This may seem strange, especially when flocks of 1000 can be seen on the Norfolk coast. However, evidence suggests that we should take heed of what is happening to other members of the curlew family, as we consider the future of this evocative species with its wonderful bubbling curl-ew calls. Our Curlew – more properly called the Eurasian Curlew – was until relatively recently a locally popular game species in Britain, especially in September and October, when birds are reputed to be particularly flavoursome. A male Curlew is equivalent in weight to a Wigeon (or two Teal) and the bigger female may well be as heavy as a Mallard, so it is not surprising that they were worth targeting. They came off the British quarry list in 1981. The Curlews that we see on the Norfolk coast in autumn and winter are drawn from a wide breeding area; some are of British origin but many are from Scandinavia, Finland and Russia. The Wash Wader Ringing Group recently received a report of a bird that was ringed in Norfolk in September 2000 and recovered in Izhma in Russia in May 2014. 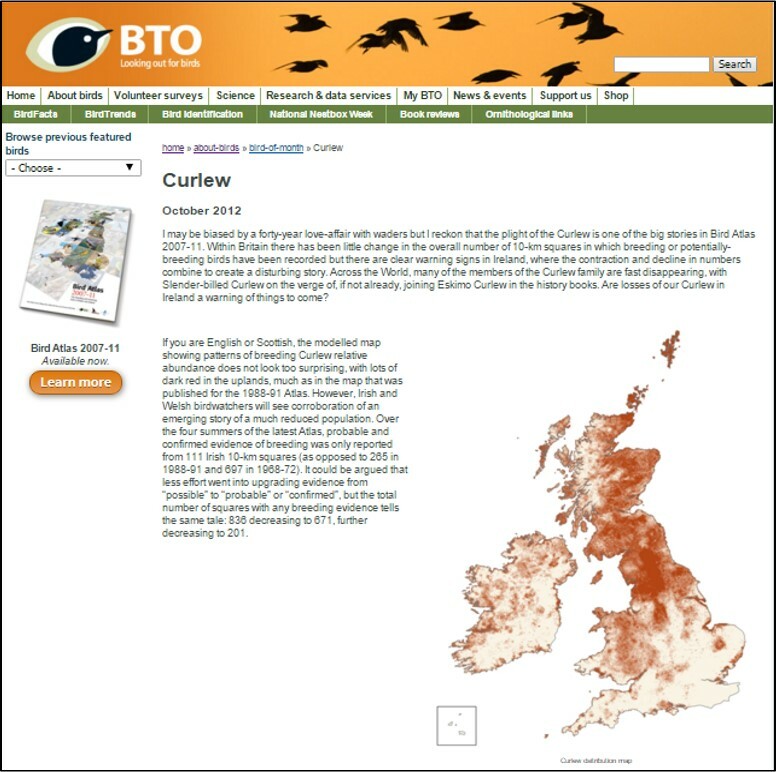 At 3300 km (2000 miles) this is nearly as far away as the furthest east dot on the map of Curlew recoveries, shown here and published on the website of the British Trust for Ornithology. The bird was an adult when ringed so must have been at least 15 years old when shot. This seems like a good age for a Curlew but is less than half of the British longevity record, set by a chick ringed in Lancashire in 1978 and found dead on the Wirral in 2011. Curlew numbers on the Wash, which sits between the counties of Norfolk and Lincolnshire, increased dramatically when shooting ceased in 1981, although milder winters could have also have been influential. In the five years immediately before the ban, the average maximum, winter Wetland Bird Survey count on the Wash was 3281, rising to 9642 in the period 2006/07 to 2010/11. There were similar increases on the North Norfolk coast and a bit further south at Breydon Water. The broader, national picture is one of increase between 1981 and 2001, although generally at a lower level to that seen in Norfolk, followed by a steady, shallow decline. If numbers are higher than they once were does this mean that we should be less concerned about Curlews – and what is the justification of the species’ near-threatened designation? Conserving migratory species is difficult because individuals rely on different resources in different countries at different stages of the year. For Curlews, there is evidence that breeding season problems are at the heart of large decreases in numbers in Russia, through the Baltic and into The Netherlands – the countries from which much of the wintering population on the east coast is drawn. According to the European Commission’s species management plan, drivers of decline include wide-scale intensification of grassland management for milk production, land-abandonment and increased predation in some areas. Autumn, winter and spring hunting is thought to have had a lesser but contributory effect to the long-term losses, with hunters across the European Community shooting between 3% and 4% of the population each year. In the last twenty years, within the EC, hunting of Curlew has been confined to Ireland, Northern Ireland and France. Much of this shooting pressure was and is in France, where coastal hunting of Curlew has been reinstated after a five year moratorium. Read new blog about this here. Focusing on Britain and Ireland, we have seen major losses in our breeding populations. 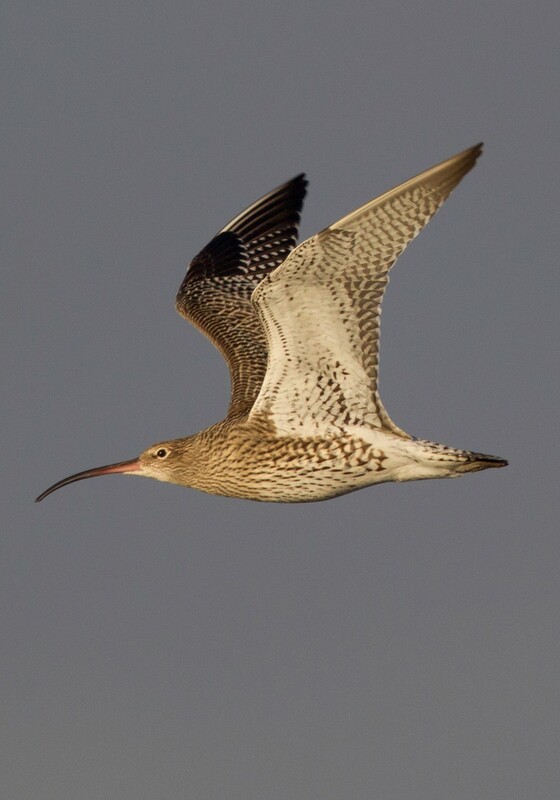 In Ireland, the Curlew population is estimated to have dropped from 5000 to 200 pairs in the twenty years between 1991 and 2011, and there has been an 80% decline in Wales. There’s more about these distributional changes in a 2012 article written for the BTO website. Curlew productivity in several areas appears to be very low and it is possible that the adults we are seeing are part of an ageing population. As has been shown in seabirds, counts of adults can give a false sense of security, as it is easy not to notice that there is little recruitment of new, breeding adults into the population, with obvious long-term consequences. The decline in the number of breeding Curlew in Great Britain is clearly reflected in monthly, winter counts undertaken by volunteers on west coast estuaries. On the Dee, for instance, the average peak-winter count dropped from 6109 in the early 1970s to 4348 in the five years after the shooting ban, rose to 5081 in the late 1990s but then slipped back to 3802. In Ireland and Northern Ireland, a total ban on shooting Curlew was announced in 2012, brought in once it was clear that the estimated November harvest of between 6% and 8% was unsustainable and set against a background of the collapse of the local breeding populations. The same local reasoning lies behind continuing protection in Wales, western England and in much of Scotland, especially at a time when financial support to land-managers is being used to try to bolster British breeding numbers. In eastern England, Curlew conservation has a more international flavour, as we provide a safe haven for birds from as far away as Russia. Britain & Ireland, between them, provide winter homes for half of the Europe-wide population of Curlews (about 210,000 out of 420,000), with the Netherlands holding 140,000 birds. There are also significant flocks in Germany and about 20,000 in France. These may seem like reasonable numbers but, given that fewer chicks are being raised, the number of adults is declining, two close relatives have been driven to extinction and other curlew species are in trouble, the label of near-threatened seems highly appropriate. 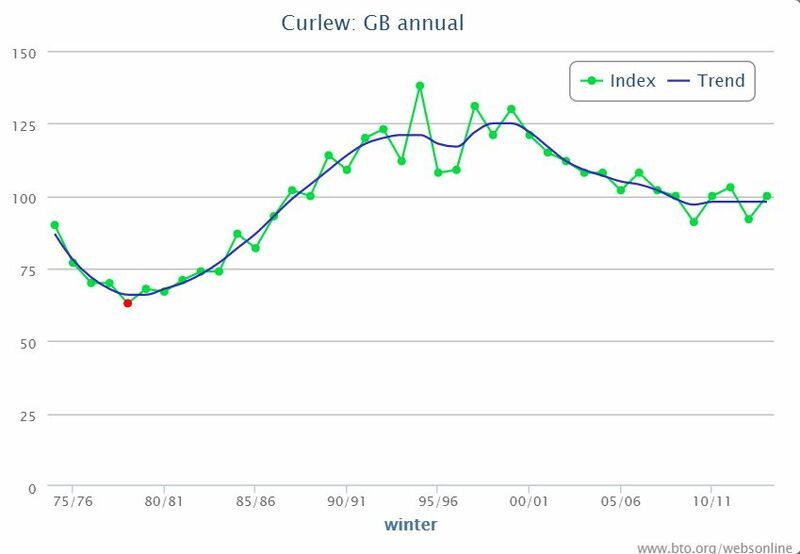 We should be proud of our wintering Curlews in Great Britain, where numbers have stabilised, albeit at a level that is 20% lower than at the turn of the century, but there is no room for complacency in Northern Ireland, where the decline continues. There is a new blog about the potential causes of declines in breeding numbers in Great Britain. Curlews can’t wait for a treatment plan.